Dubai, the City Of Gold. Dubai blends in a very rare combination of new and old Arabian spirit. It is a very welcoming city and because of the philanthropic nature of the merchants who come here, it is also known as the city that cares. It truly is a city of contrasts. It has come a long way to its glory and is home to many world class sporting events, awe inducing architecture, and some of the most incredible attractions in the world. If you are wondering if that is all, we have not even gotten started. Dubai houses the world’s finest and world’s highest seven star hotel, some of the biggest shopping malls, man made palm shaped beaches with apartments built over them (the 2nd man made creation visible from the moon itself, after the great wall of China) and is also known for the famous desert safari. 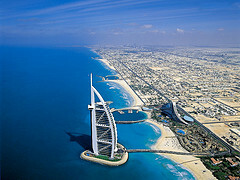 If you want to talk about destinations that offer something for everyone then Dubai is a great place to start. It is also a destination where a one week vacation is definitely not enough. 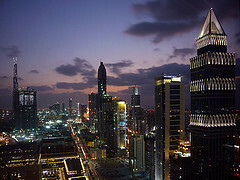 Dubai is one of the seven emirates of the UAE, Abu Dhabi, Sharjah, Ajman, Fujairah, Umm Al Qwain and Ras Al Khaimah. 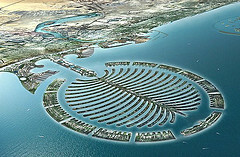 Dubai is also the most populous one and is situated at the southern coast of the Persian Gulf on the Arabian Peninsula. The government rules within the framework of constitutional monarchy. 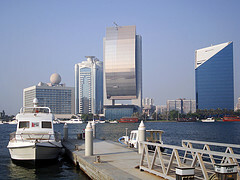 Dubai houses a sum total of about 1,422,000 residents, 71 % of whom are from India, Pakistan, Bangladesh, and other Asian countries. Owing to such a multi-ethnic blend, Dubai has become a very multilingual place. With Arabic being the official language, languages like Urdu, Hindi, English, Malyalam, and Persian are also spoken. Islam is the official religion. Besides cultures that have been mentioned, Dubai also houses communities like Hindus, Muslims, Christians, Sikhs and Buddhists. Climatically, Dubai is aridly subtropical. The skies are generally a crystal, clear blue and the weather is hot and humid but does not take away from the beautiful atmosphere. Rainfall is irregular and scanty. The time period between December and March is considered to be the best time of the year to visit Dubai, but also the most expensive. The months of June to September are generally considered the off season thus you will have to deal with some poor weather but can find some great travel deals. Dubai is a conservative land when it comes to fashion and getting dressed. It is advisable to follow the local code of conduct because showing skin in certain situations is not always tolerated here, and it might upset the local’s sensibilities. Fishing, pearl diving, and part time farming are still the traditional occupations for earning livelihood in some areas. However, big business and massive corporations are boosting the economy, creating wealth, and creating a number of job opportunities. Dubai is very well connected to the rest of the world. It boasts about 105 airlines which connect it to 125 cities around the world. The currency of Dubai is a Dirham. At the moment 1USD = 3.67 UAE dirham. Thanks to the rising housing prices and a rise in inflation over the past couple of years, the cost of living in Dubai has risen considerably. As they say every dark cloud has a silver lining, and the government does provide subsidies for electricity, water, and gas. Besides, like any other country, cost of living depends upon the lifestyle one follows. You can find ways to leave cheap and comfortably or you can choose to live in the lap of luxury with all the western essentials. Outstanding employment prospects attract more and more people to Dubai every year. The fact that there is no personal tax is a welcome invitation to attract people to work here. Telecommunications, IT, engineering, construction, oil and gas, media, and medicine are the industries that are booming and they provide a lot of employment with a handsome salary to each. Working hours and pay scales vary from industry to industry and job to job. Dubai also boasts of an excellent working environment and a well equipped, modern, and clean place to work. Rental accommodation is advisable, easy to secure, and generally of a incredible quality, although foreign property ownership rights of 2002 have made it pretty easy for one to buy his\her own piece of land. There are many people that will argue for purchasing property, while others will tell you that renting is the way to go. The decision really comes down to personal choice and of course the relatable property deals in Dubai that you can find. Thus, be it from a vacation point of view or a job that you are seeking, Dubai undoubtedly is one of the best places in the world to look at if you want to move abroad. Dubai is by far the wealthiest state within the United Arab Emirates and is a top tourist destination for obvious reasons. While vacations to Dubai are attractive, a lot of attention in terms of employment opportunities is being turned towards Dubai. An infinite number of jobs are opening up for workers from all different walks of life with a whole host of different skills. The economy is booming with an estimated value of USD $37 billion. One job opportunity in Dubai is for pilots as they are in high demand, especially from Emirates Airline their national airline. A large number of expat pilots have jumped on the opportunity and landed lucrative contracts that are not always available in other places.There are also a number of job opportunities for people that work in the financial sector. A recent trend has seen a major increase in the number of accountants that are being hired in Dubai. The incentive packages for accountants in Dubai are incredibly attractive and offer cars, high salaries, and a host of benefits. If you are worried that there are only employment opportunities in Dubai for certain skilled workers, that is not the case. There are quite a few job opportunities when it comes to management positions with new companies that are setting up shop in Dubai. There are high profile companies such as Kraft Foods that are constantly looking for new workers to handle the boom in business. There is a shortage for trained professionals in the region right now and a great number of migrant workers that are more than willing to take advantage of that. Dubai truly is one of the few countries in the world that can actually boast a growing economy. There are also a number of job opportunities in Dubai for workers that are less skilled, or trained when it comes to skilled trades. The oil companies in Dubai are desperate for more man power and there are tons of jobs in the tourism industry for room service attendants, waiters, receptionists, and even bag boys. In the right places and at the right time even these jobs can return a six figure income. To top off everything, Dubai is also an inviting and comfortable place for people that crave fun and excitement. There are an infinite number of clubs, parties, and events. There are places to unwind and lay out on the beach, some of the finest restaurants in the world, incredible attractions, natural and manmade, and a never ending list of things to do. The best part is that the attractions are easily affordable thanks to the incredibly wealthy economy that exists. Finally a place where you can land a salary that will allow you to live comfortably. The quality of life in Dubai is staggering and promising for expats all over the world. Opportunities like this do not come around that often, especially in today’s economy, so you might to consider diving into Dubai headfirst. Who wouldn’t want to take advantage of so many opportunities?